We have gone from having probably an acre sized garden to having none. I got a wee bit burnt out with the acre one in Ohio, then with a move last spring I opted out of gardening all together. I decided to support my local farmer's market instead. This year I was interested in a garden but hubby didn't feel he had the time for it. Here is hopes that next year we will be able to dive back in. I would so miss having something fresh this summer though! 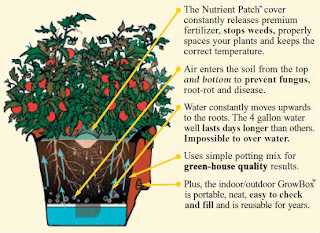 The Garden Patch Grow Box is perfect for my tomato plants. The very worst part of gardening for me is the weeds! My children would agree as they have spent years 'weeding the beans'. They aren't crying that there is no garden this year. The Grow Box has no weeds! Love it! Wish I could have an acre full of these boxes! So easy to use, the Grow box does everything for you. Just make sure you keep the bottom full of water, and the Grow Box does the rest! Super easy to assemble, my 11 year old put this together for me! You just snap the unit together and put your dirt in. It did recommend buying potting soil, but I live on a river and I am a cheap skate, so we used river dirt.. full of extra nutrition! You then lay the nutrient rich cover on top, and plant the veggies. You can put just about anything in the grow box! I really could have used an acre of them for all the ideas in my head. The thing we love the freshest though was tomato so that won out. We planted three plants in our Grow Box. While we were at it we planted some herbs in other containers. I will probably get a grow box for these next year as well. 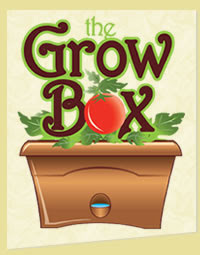 The beauty of the Grow Box is you can reuse it from year to year. You just need to purchase a new Nutrient Patch for it. No bending, getting down on my knees to weed! The ultimate raised bed garden. I think I would grow herbs in the Grow Box. I would love to grow tomatoes or peppers. I would grow peppers and tomatoes. I've wanted to try a Grow Box for AGES! I'd grow cucumbers. I would grow herbs or tomatoes! I would grow tomatoes or green peppers. Too late to get some tomatoes going, so herbs or greens for now, maybe broccoli later. I love the idea of this. Comes a long way from the 5 gallon buckets I used to use. I'd do strawberries or zucchini. I want to grow tomatoes or herbs! I would definitely start out with tomatoes since we use them in homemade salsa! I would grow a salad or a salsa themed box. I would let my son choose.He is really into Gardening with his daddy. I'd grow herbs. Parsley, basil, and sage, at least. I'd grow some herbs. They are expensive to buy, but easy to grow! I would grow tomatoes! My boys love them!